Here at NLM, we like to think of our staff as quick—as in intelligent, bright, clever, and sharp-witted. But one member of our staff recently proved on the world stage—or shall we say world track—that she’s also quick footed. Sandy Lee Triolo just returned from competing in the World Masters Indoor Athletics Championships in Daegu, South Korea (March 20 to 26). Although the digital asset specialist contractor in NLM’s Audiovisual Program and Development Branch has competed nationally for the last five years, this was her first international competition. The Gold Team: Left to right the W55 4x200M relay team: Lorraine Jasper, Cheryl Bellaire, NLM’s Sandy Lee Triolo, and Joy Upshaw. 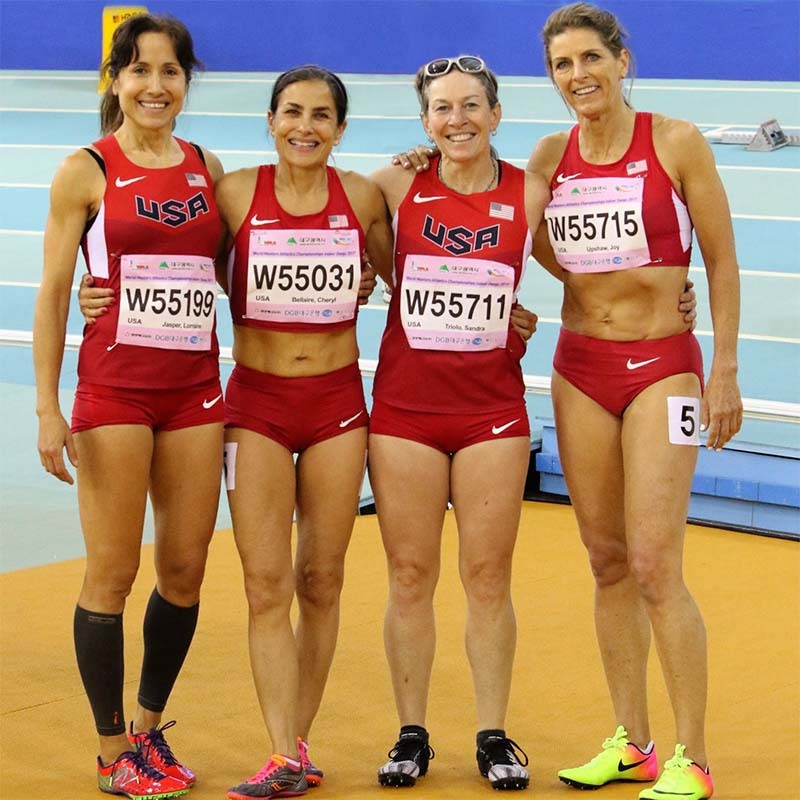 Having just turned 55, Triolo said, “I just moved up to a new age group and felt ready to see how I would stack up to my age group in the rest of the world.” Five thousand athletes from all over the world competed. Triolo saved her best race for last. The team won gold, setting a new American record for the age group. “Our names are in the books for the American record,” said Triolo of her and teammates Cheryl Bellaire, Lorraine Jasper, and Joy Upshaw. April 6, 2017 in People. Congrats Speedy Lee. Well deserved recognition and great promo for our sport.